I love spring cleaning. And fall cleaning. Any cleaning at all. Not that I do it often, but when I do, what a rush....What I like best is the satisfaction of knowing I have renewed a sense of order in my home; somehow, squaring the corners makes me feel more composed in my own mind. I also like to notice the little accidents of decorating. They give a tiny swell of pleasure to the eye. I had just washed a dish, made by my friend Judyth van Amringe, and set it out to dry. I put a moss-filled pot, made by my friend Frances, on it, so the water could drain. I rinsed some more dishes, and put the sponge and brush up on the dish, so they could drain, and before I knew it, I had created a small still life by the sink. A nice place for pleasing compositions; as the household gods know, we spend enough time in front of the sink. 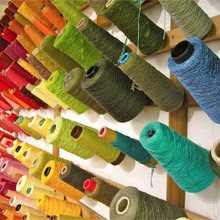 I look at this and think about my friends who make things with their hands, and how awesome that is, and how inspiring. And I think about those big old French bars of olive oil soap, how they get carved and melted by use, and develop patina, and how lovely they are compared to those plastic pumping antiseptic things we now use (and which, by the way, aren't helping us maintain are own immunities to colds...good riddance.) Sometimes, we stop seeing our little domestic treasures--they are too familiar to our eyes, they disappear. By rearranging them, and giving them new purpose, we refresh our delight and renew our affections. Wonderful inspiration from you this first Sunday in May. Thank You. Now--off for a bicycle. I was, only five minutes ago, "misting" (as I've been strictly instructed to do by my canny webmistress) the small-but-fascinating terrarium she made for Herve's 40th birthday a couple of weeks ago. It's made from an old, glass-domed candy-dish which is about eight inches wide. Inside, there's a big, rounded hillock of thick moss...out of which stick one deer-antler lichen and two tiny replicas of grimacing, Easter Island statue/heads. My webmistress, Sarah Ovenall, made the clay figurines (?) herself, of course. It's just a fascinating, simple thing. Herve adores it (as you might guess, everything else in and about this joint is anything but "simple"). 1. Is a big wheel, so to speak, in the "art car" world. That seems to entail road trips to parades in faraway places such as Austin. Her current car is decorated with about 800 barbie dolls and marine animals (all plastic...don't worry). She chose the theme "Undersea Mah-Jong", as we all do from time-to-time, of course. Before this car, she had a locally-famous one which was plastered with about 1000 plastic pigs of various sorts. 2. She also gardens ferociously and, on a whim, designed (and profitably published) "victoria regina" tarot cards. That would be before she married George, her very nice boyfriend of ten years.....they had the job done by an Elvis impersonator in Las Vegas a couple of years ago. 3. I forgot....she also hosts a weekly radio show, "Divaville Lounge" (showcasing vocalists from 1940-1960), that's broadcast out of Duke's station. I simply can't keep track of all the things she does. I wish there were a way of posting a photograph of her along with this....I neglected to mention that she's small, very cute, and sews her own dresses from 1960's patterns. In any case, multi-talented friends are, as you said, a great treasure. So is good, basic, olive oil soap. We bring back twenty or so of those big, square cubes of the Marsellaise variety from France (where it costs a fourth of what it costs here) three times per year, and the in-laws bring a box of it here twice per year. Not that we're THAT dirty....we give it (along with sea salt and good mustard) to all of our friends. In the USA, of course, such products are regarded as "luxuries" and priced accordingly. Lovely piece of art. I too have done this throughout my house with gifts from friends or things I have found to fill my soul. Happy Sunday to you. I also love that your share your friends beautiful works with us by giving their websites. Funny you should mention spring cleaning today as I am on ladders, washing blinds, purging my closet, and filling bags and bags of donation clothes. Music is on, I am in the groove and it's kind of fun. Must be, i am also making lists of other areas to clean and organize. Domestic pleasures indeed, clean and organized is so much better and I have been remiss the past few years. I am a really diligent cleaner right now and it feels good to bring order to my home. Well now I am off to find out who David Terry AND his friend are after such a great comment which falls on the tail of a great post. One that makes me giggle a bit because the word or the idea of simplicity or simple pleasures has been hitting me in the head from different sources all day. Will, at the very least put a little something green on the kitchen sink now. I just came in from two hours of tilling in cowshit and re-read: "Sometimes, we stop seeing our little domestic treasures--they are too familiar to our eyes, they disappear. By rearranging them, and giving them new purpose, we refresh our delight and renew our affections." That's a fine, lovely, and wise passage....particularly the last phrase. There's a very good reason so many people (I'm one of them) take delight and actual inspiration from Ms. Browning's writings. It's too bad we're past the days when someone like Ms. Browning could have a weekly column in, say, Reader's Digest or "Parade" magazine. Obviously, she's quite sophisticated and has certainly seen her share of expensive gee-gaws and fripperies. That said?...a lot of folks (who don't happen to have Faberge eggs, etc) would benefit from and enjoy her writings. Ms. Browning's remark would apply equally to a grandmother who's proudly re-arranging her two grandsons' pottery from grade-skool art class. I just talked with my 74 year old mother in Tennessee, who's doing that exact thing this afternoon (for better or worse, both the grandsons, who are 7 and 12, live a mile away and are THERE this afternoon). I read Ms. Browning's comment to her, and my mother said "That is SO sweet....she's right." Ahh, Sunday morning is so wonderful for puttering. An article by someone I can't remember, oh well, said that puttering is wonderful for the brain. Renewing, refreshing. I spent the morning puttering in the garden. Made the first foray against the bindweed, edged the perennial border, worked on a new bed and finished off by filling containers with softly fragrant white azaleas and small votives with boxwood prunings. So liked your arrangement on your friend's charming plate. It's a lovely thing to keep our loved one's at hand. Yes. You are blessed in your many creative friends. They recognize a likeminded spirit. A delightful for post. I, too love to clean. 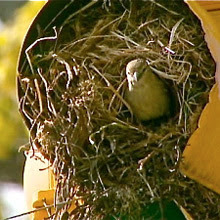 I adored your *Tiny Nesting Pleasures. * Happy May Day to all! Cleaning and organizing are my favorite things to do, I am one of those people who crave a clean organized habitat...it seems no matter how hectic or miserable my day has been, if I come home and open my door to a clean house...I feel instantly better. And yes, I have been doing the type of decorating you mentioned for years...really sometimes making something out of nothing, simply by putting complimentary colors and textures together. As for the soap, I have fallen into the antiseptic soap trap poured into very attractive containers of different sizes. You have made me rethink that...I'll be going tomorrow to buy my favorite french milled soaps again. The last bars i bought were just too large, I cut myself trying to saw the bar in half! My favorite?..Lemon Verbena, but I will be looking for the Olive Oil now. Oh, while I'm on the subject of cleaning..I found the nicest smelling product...its name is Fabulosa..it is not expensive at all...and it leaves a lingering fragrance that is very nice. Another is Mrs. Meyers..it has several nicely fragranted products. I gather that your experiences have been different from mine. I can assure you that, until relatively recently in my life, every single sprezzatura "roll in the hay" I ever had was immediately followed by an enthusiastic, day-long embrace of every single cleaning/hygienic implement and product I could lay my hands on. Some of us were, it seems, meant to be loners. In my defense, I'll add that I've never had to spend a bit of time in a county health clinic and am, in short, an chronically enthusiastic advocate of cleaning products. To be honest?....one of my longstanding habits (when friends are visiting and have innocently asked "what's new?") is to go on and on about some cleaning or cooking aid I've recently discovered. Fortunately, I usually catch myself (most folks yabber this enthusiastically only about new grandbabies or surprise-dividend checks from long-forgotten utility stocks). I subsequently try to mock myself by standing there, like a housewife in some 1960's commercial....holding the item so that THE LABEL SHOWS and declaring "I LOVE this product!" Love that domestic still life. I often stop and smile at the little "vignettes" around my house, that are sometimes accidental and sometimes arranged. I agree with you that great satisfaction comes from a sense of order in our homes, though it's often easy to put off. But when I do it, bit by bit, it always has a big payoff in peace of mind. 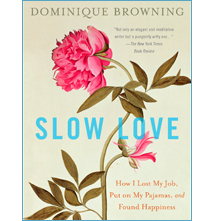 I love the way Dominique is able to express herself so well in all her writing, it is what drew me to buying her other books, after I read Slow Love. I read them over again from time to time...Only someone that gets joy out decorating and visual pleasure could relate to this blog. Oh, I have to say I was at the store today and purchased Fabulosa..very reasonable and really does have the nicest fragrance that stays for a while...I used it everywhere, thank you for that tip! ... comfort chores ... my mother always called puttering about "comfort chores"
Okay, I admit it, I too have an obsession with a cleaning product: Florentino soap made in Italy -- there's more identification imprinted on the bar but I can't read it as it is in Italian and my reading glasses won't translate it -- my secret supplier is the discount store Ross. I have the ivory bar sitting open in its lovely rose garden box right next to my bedside and it perfumes my bedroom with cleanliness. Plus, when I have that craving for a cigarette I take a huge whiff of the rose scent, this works better than nicorette -- such nasty stuff. A roll in the hay? Not in the purview of Slow Love Life blog--that's every kind of love. But luckily, my heart has room for hay rolls and soap dishes. Please, I love to hear about great cleaning products, share away! Helene, make sure you get a wetsuit specifically designed for swimming (so that the arms have more flexibility, etc.) otherwise you will be struggling. I haven't dared go in yet...soon.